Gamay is a dark purple grape grown in many areas, but most noticeably in Beaujolais. It is also grown in The Loire Valley, The Willamette Valley in Oregon, The Niagara Peninsula in Canada, and Australia. Officially it is called "Gamay Noir à Jus Blanc." Gamay tends to make light acidic red wines. In general, it is used to make non sparkling red wines, most noticeably Beaujolais and Beaujolais Nouveau. Beaujolais is a fun wine and most consider it to nothing more than a cheap, simple, and fun red for early drinking, although there are also some fairly serious Beaujolais made and Beaujolais producers who make big and age worthy wines (for example Morgon is one of my favorite Beaujolais Crus and there are certainly some great Morgons). Not everyone likes the Gamay grape. For example, in 1395, current Duke of Burgundy, Philippe the Bold outlawed it and the ban was upheld again 60 years later (where do they get these silly names? -maybe he should have been called Philippe The Bald instead?). And many Burgundy fans, and Beaujolais is in Burgundy, consider it to be an inferior grape and do not drink it at all. A quick look around the Internet finds both Cerdon and Domaine des Nugues' "Made by G" Sparkling Gamays which are roses. 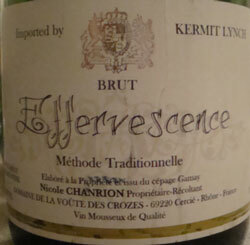 But had never before ran across or heard of a sparkling wine from Gamay, so I was very surprised when I ran across one in the New Hampshire State Liquor Store. I found a bottle of Domaine De La Voute Des Crozes Nicole Chanrion Effervescense Sparkling Gamay made by the "Methode Traditionnelle. Since it was imported by Kermit Lynch, an importer with an awesome reputation, I decided to try it and at US$20 or so it wasn't a hard sell. Methode Traditionnelle of course means it's made the same way as Champagne; with the bubbles occurring due to secondary fermentation in the bottle. This is arguably a better, and certainly more expensive, method of making sparkling wine than other methods, like pumping CO2 into the finished wine. The tasting note is below, and it was basically mediocre. In its defense, I drank it in the dead of winter and I think it would show much better on a very hot day and might be fun to drink in the afternoon while sitting in the sun much like a simple French country rose! Tasting Note: Domaine De La Voute Des Crozes Nicole Chanrion Effervescense Sparkling Gamay - Rated C+ only because it may be fun on a hot summer day! Light yellow color, actually looks like ginger ale. The nose is very fresh with some light apple and a little pear. On the palate there is some light apple and an odd almost bitterness that lingers. Some confectionary sugar. This is pretty weird and we didn't finish the bottle even after two days. It's not horrible and I imagine it would be quite refreshing and pleasant to swag on a very hot summer day sitting outside under an umbrella with friends. It certainly is better than drinking Bud Lite!